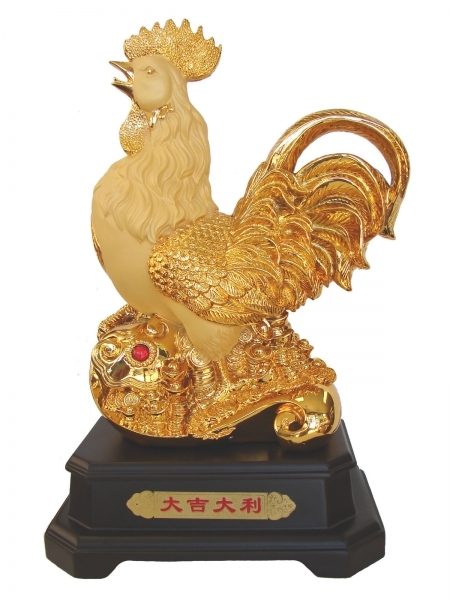 This beautiful majestic rubber finish golden standing rooster with feng shui ru yi, coins and ingots under it is believed to bring good luck, prosperity and wealth in for the year of the rooster 2017. One wooden like stand is going with this rooster statue (glued together). The Chinese words on the stand have the meanings of "Big Prosperity and Big Wealth". 2017 is the year of the rooster. Placing such beautiful feng shui golden rooster statue with month open can gather fame luck, good career luck and harmony chi. The overall dimension of the whole golden rooster statue is approx. 10.5" x 7.5" x 17" . It is made of resin.